"For You, Not For You" is part of an ongoing series of 'Unseen Performances' that deals with the ideas behind performance art and how it is experienced. The performance was done before the scheduled time of its viewing, which did not allow any audience to directly watch the performance. The lack of performer (myself) heightened the other senses that are active when viewing a performance but may be less considered. Smell can be a strong component of a performance, in this case it is the smell of sawdust. The energy that can be felt during a performance is not present during the documentation of the work, be it a video or a photograph with a description, and this work deals with the topic more directly. Is that energy still present even after the performer has left? How long does the energy stay within the space? This work also discusses the post-performance artifact and how it can be perceived as a sculpture. The lack of performer present causes the audience to imagine the act, placing the 'performance within the mental space,' and makes the viewer aware of the physical space in front of them differently than if they were witnessing someone moving through it. The structure itself begins to be the performer, replacing my body. 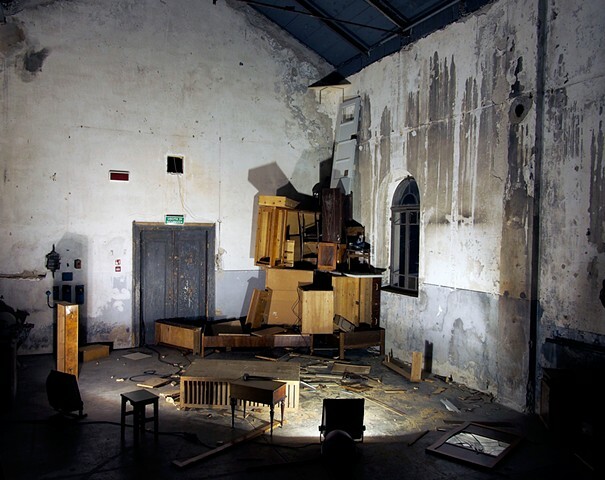 The photograph of this structure still keeps the performance within the boundaries of the post-performance-documentation while it actually is meant to be experienced firsthand.